So, you have just prepared the perfect meal. But, if you are going to serve wine, which one would be best to “pair” with the dish? Depending on your guests, this might be single most important selection to consider for the success of your dining experience. As a general rule, white wine works best with light sauces, pastas, and light meats. Red pairs nicely with red tomato sauces and red meats. These are just a general guidelines, however. Keep in mind that you may have guests that *only* drink whites or only reds. Consider serving both white and red if possible, perhaps serving a light white to start off with hors d’oeuvres. This suites my own personal tastes very well. I often like to start with a glass of white wine served with appetizers before dinner to clear my palate. Once you have chosen white, red, or both, think about the characteristics of the food that you will be serving with the wine. Is it spicy? Is it mild or intense? Is it sweet or salty? What variety of wine should be selected for what types of food? The flavor and characteristics of the wine will come through more if the food is mild in flavor and has less spiciness. For example, for a hearty beef stew or steak, consider a full-bodied dry red, such as Cabernet Sauvignon. Rich, white cream or garlic sauces might go great with a rich Chardonnay. A delicate white fish, pork, or poultry dish might soar with a fresh, crisp Pinot Gris/Grigio. While, a spicy red lasagna will pair nicely with a simple Italian table wine. Is the wine high in acidity? Acid in wine will help offset sweetness or saltiness in food. It will also help cut through spicy flavors. Is the wine have strong in tannins? You might best notice tannins through a puckering or “woody” sensation on your tongue and drying out feeling in your throat. Tannins come from the skin and seeds from the grapes, and are such, are much more prominent in red wines. Tannins give structure to a wine, and are considered positive quality for aging. As wines age, the tannins settle, becoming sediment in the bottle. This, in turn, softens its intensity. I tend to gravitate to those wines with strong, firm tannins. And, I love unfiltered wine…don’t be afraid of a little sediment in the bottle! Avoid combining dry tannic wines, such as Cabernets, with sweet flavors, such as deserts. This will completely destroy the complex flavors of a rich powerful red. When having desert, set aside the wine for a time until you have a chance to cleanse your palate with coffee or cheese after. Never serve wine (even the reds) at room temperature, if possible. White wine is ideal at about 50 degrees. And, depending on the variety, reds should served between 55 and 65 degrees. These are general guidelines. Experts may tell you the exact temperature to serve each variety of wine. Experiment, and see what you enjoy. The idea here is that the wine should be served below room temperature. Served at a proper temperature, you will find the true qualities of the wine will shine through. 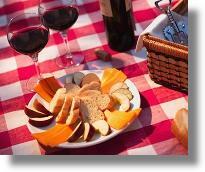 A small plate of cheese set out with mild crackers or bread can be a perfect way to “cleanse your palate”. There are a myriad of cheese selections out to try. Pairing a cheese with a wine is much like pairing a complete meal with wine. Try to compare a couple difference cheeses at the same time to see what you like with certain wines. As an idea, perhaps consider a strong 5-10 year old cheddar with a powerful wine such as zinfandel, while select a mild brie to accompany that perfect Cabernet Sauvignon. Personally, I very much enjoy small slivers of various cheeses as I make my way through a glass. There are no absolutes when it comes to wine pairing. Experiment, both on yourself and your guests. People have different tastes, so be flexible. These “rules” are simply helpful hints to guide you on your wine pairing journey. Not only will the proper wine add wonderful presentation to your dining event, but the selections that you present to your guest in their glass may very well make or break the experience. When pairing wine to food, think of it this way… The flavors of the food and the characteristics of the wine will mingle together to create entirely new sensations. Practice and perfect Your guests are sure to remember from your perfectly “paired” meal!